Elite Dangerous’ third season, entitled Beyond, wraps up next week. Frontier Developments are promising Beyond – Chapter Four is the meatiest Elite Dangerous update yet, with features like expanded asteroid belt mining, online squadrons, and a variety of new scanners and exploration tools being added. You can check out the launch trailer for the update, below. You can get a better look at Beyond – Chapter Four in this hour-plus gameplay stream. And here’s a nice look at the update’s new ships. A new Analysis Mode, with the improved Exploration Discovery Scanner and Detailed Discovery Scanner, is a game-changing new way for all Commanders to explore the galaxy. After an initial scan of the system, players will then be able to tune their scanners to find stellar bodies and other phenomena. Not only is this new system a more realistic, satisfying and engaging exploration experience, but also provides players with the freedom to make more informed decisions on where to look next, and be ultimately better rewarded for time spent exploring. Squadrons are a new way of uniting like-minded Commanders to support factions of their choice, take part in Community Goals together and compete for top spots in weekly leaderboards. Squadrons also feature new communication tools, including in-game chat channels, to coordinate activities across the galaxy. Elite Dangerous is available on PC, Xbox One, and PS4. 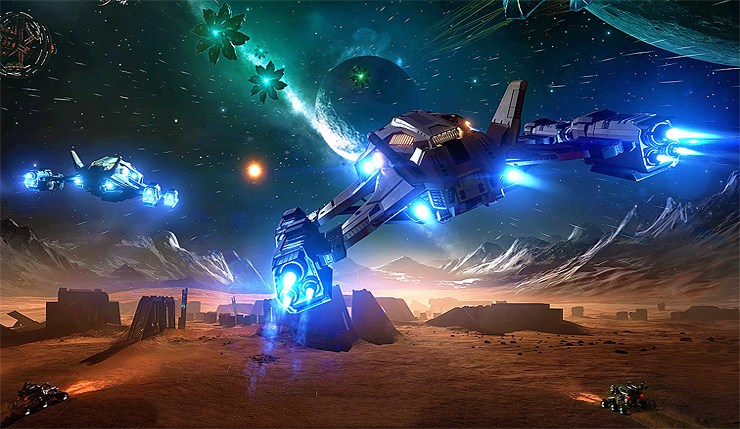 Beyond – Chapter Four will launch on all platforms on December 11.